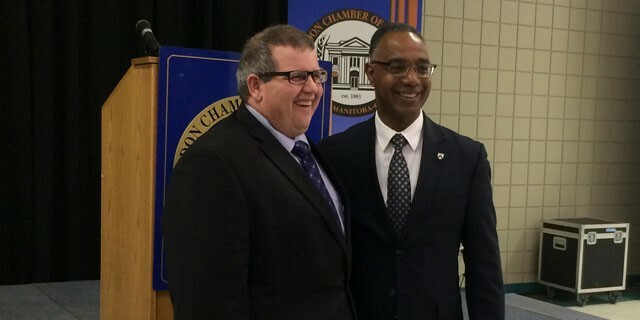 Assiniboine Community College president Mark Frison and Brandon University president Gervan Fearon. BRANDON, MB — Business education in Brandon could look a lot different over the next few years, as the city’s two post-secondary institutions have agreed to explore the concept of a hybrid business program and future joint school of business. “A joint school between ACC and BU would offer significant benefits to learners, employers and communities,” said ACC President Mark Frison. This new initiative builds on a growing history of collaboration between Assiniboine Community College (ACC) and Brandon University (BU). Historically, the business administration programs have seen high numbers of students moving between the two institutions, taking advantage of transfer agreements that create multiple pathways for learners. We see this as a great opportunity to grow our business programs to better serve the needs of the Brandon region and the province. The first step of the new collaboration will be the creation of a formal hybrid business program, building on the existing 2+2 program that allows students to receive transfer credit when moving between the two institutions. The hybrid program would have multiple completion points for business students, with different credentials available at each stage, including diploma and degree options. The institutions will explore offering new degree majors such as human resources, marketing and hospitality in addition to the existing accounting major. In the future, the program could expand to graduate level with some already expressing interest in an MBA program. “This will contribute to making Brandon a destination for post-secondary education, attracting more students from across Canada and internationally,” Frison said. The institutions will also explore a co-location for the new joint school. In 2014 the institutions, along with the Province of Manitoba, signed Growing Together – Vision 20/20, a memorandum of understanding aimed at fostering collaboration between the two institutions to meet student, community and social needs. Under the Province of Manitoba’s recently released post-secondary strategy, collaboration is a central theme. The relationship between ACC and BU has been recognized as a model for cooperation in Manitoba and both institutions say that now is the ideal time to strengthen that connection. Assiniboine Community College (ACC) has been providing exceptional learning experiences for over 50 years. For staff and students alike, ACC offers unparalleled learning environments and responds well to the demands and requirements of the Manitoba labour market. Instructors follow the philosophy of ‘learn by doing’, combining theory with hands-on learning inside classrooms, labs, kitchens, shops, fields and the college’s Sustainable Greenhouse. ACC offers over 40 unique diploma and certificate programs across a variety of disciplines including culinary arts and hospitality, business, agriculture and environment, health and human services, trades and technology. The college also delivers apprenticeship programming in a range of skilled trades disciplines. The college welcomed more than 3,200 full-time students last year. With campuses in Brandon, Dauphin and Winnipeg, ACC provides comprehensive education opportunities throughout Manitoba. The college also partners with many communities and organizations across the province to deliver customized education and training. Brandon University, established in 1967, has roots dating to the founding of Brandon College in 1899. With a focus on academic success and the student experience, BU is a vital contributor to the economy and continued development of the Brandon region and the province. The university also partners with First Nations, Métis and Inuit communities, to deliver valuable, customized educational programs. The university has an enrolment of more than 3,100 students, a growth of more than five per cent in the 2015 academic year, with degree programs offered through the Faculty of Arts, Faculty of Education, Faculty of Science, Faculty of Health Studies, Faculty of Graduate Studies and School of Music. BU strives to be a leading university of choice for students, faculty and staff, with an inclusive, collegial and student-centred culture.